One could argue that the measure of how good software is, or what kind of effect it has on the wider world, can be based on the hard statistics of use, punctuated by glowing reviews, which add up to ongoing popularity and ubiquity. But the true impact of how software transcends mere popularity to positively change the world can be measured solely in how it affects people’s lives. The journalist in me could give you just the specifics of the new Tux Paint release: Tux Paint 0.9.22 was released this week, thanks to the efforts of 170 contributors worldwide. This new version comes with a wide range of additions, like 14 new tools, 40 new template pictures, nearly 200 new stamps, SVG and KidPix support, an enhanced text tool, and accessibility improvements. 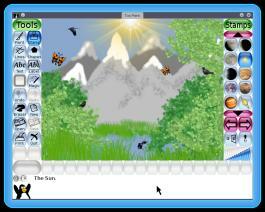 Tux Paint version 0.9.22, released last week, contains many improvements. Or I could go into the expansion of 32 new languages featured in the latest release, including more than a dozen Indian subcontinental languages, including Nepali and Sanskrit; six European languages, including Bosnian and Valencian; nine new African languages, including Zulu and Sudanese; and the Canadian Inuit language of Inuktitut. This is 32 new languages atop the updates to the 90 current Tux Paint languages. Of course, Tux Paint 0.9.22 also is available for multiple operating systems, including the usual suspects of Linux, MacOS, and Windows. But the father in me would prefer to give you an additional perspective that goes beyond these simple facts, preferring to show the far-reaching impact this software has made in the lives of thousands of kids over the last dozen years. One kid in this “cast of thousands” is my daughter. Let’s fast-forward to the present, her junior year of high school, where she’s on the yearbook staff doing graphic design. Her “high school job” to earn spending money is drawing illustrations for online publications. She easily graduated over the years from Tux Paint to a variety of FOSS programs for creative types like Inkscape and GIMP, but it was Tux Paint that started her on her current creative journey. This is not an original story, of course, but it doesn’t make me any less proud to have such an artistically talented daughter. Also, I don’t think I can be any more grateful than I am already to lead developer Bill Kendrick and the Tux Paint team for their efforts in making software which, in so many cases, inspires children to push their artistic boundaries to the limit, and then some. Tux Paint is a project that does FOSS right: A wide-ranging team labors for the good of the program and consistently puts out quality software without fanfare or self-congratulation. The proof, as they say, is in the software itself: high-quality software which enjoys a high degree of acceptance with teachers and parents, to say nothing of holding the interest – and unlocking the creativity – of children. Like any other FOSS project, Tux Paint can always use some help, whether it is of a financial or of a volunteer nature. Go grab the software and give it a try – especially if you haven’t tried it already and double especially if you have kids. You never know, after sparking the flame of imagination with Tux Paint, your little one could grow up to be the next Picasso. Larry, my daughter also loves TuxPaint. She’s just aging out of it now, but for almost all ages it’s a terrific application — one of the best free-software applications for kids, for sure.